A premium synthetic leather upper provides a streamlined and comfortable fit. All Conditions Control technology grips the ball instantly for excellent control in both wet and dry situations. Created to provide a larger ball-striking surface these boots feature off-centre lacing, at the top of the foot, shape correcting memory foam improves power and accuracy. Raised fins cause greater friction and increase ball spin, enhancing control over the ball's trajectory for added accuracy. 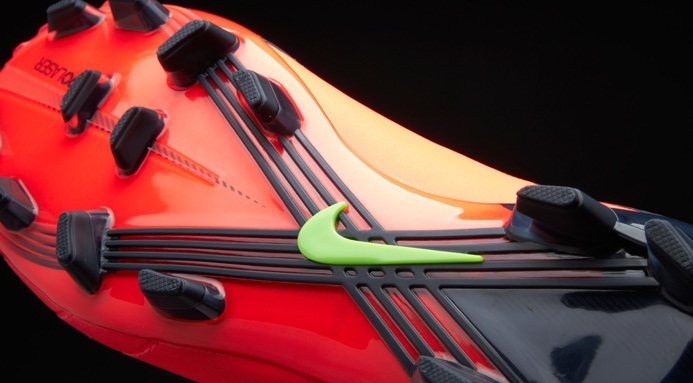 The redesigned shot shield also increases flexibility to enhance the natural motion of the foot. The power zone on the shot shield is made of triangles on flexible strips that enhance shot accuracy, and a thin layer of foam on the lateral forefoot provides cushioning and great ball feel. The Nike Tiempo Legend IV has a improved full length lightweight tpu outsole plate with a combination of conical and bladed studs allowing firm ground penetration, traction and pressure dispersion.